If we can somehow develop the idea that individuals and community groups — i.e., the public — can and should play a greater role in deciding and creating what they (we) see on the mass audiovisual media (MAVM), then we will have taken a major step forward. The journal of the Left Front of the Arts, LEF, was where the fathers of Soviet and world cinema, Sergei Eisenstein and Dziga Vertov, first announced their theoretical projects. 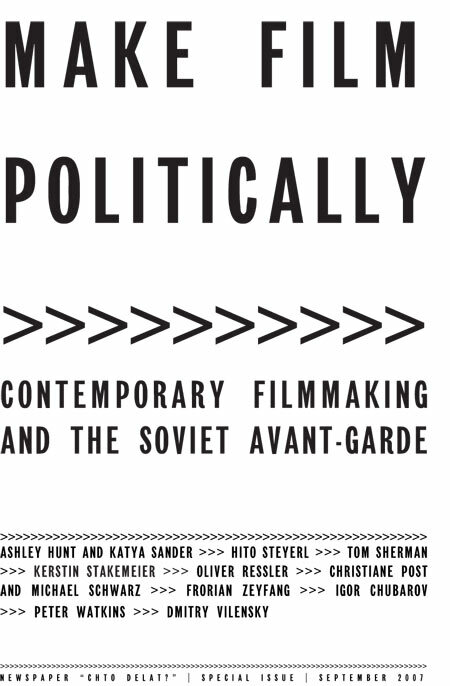 It was still difficult, however, to sense in these brief manifestos («Montage of Attractions» and «Kinoks») the principal differences in how the two men saw the nature and tasks of (Soviet) cinema. These would become apparent later, in the late twenties, and would be impartially discussed in the pages of New LEF. I began to make films because of I was interested in forms that allow the presentation of artwork beyond the boundaries of art, a field I sometimes find restrictive. The majority of my films could be understood as attempts to afford more visibility to activist practices and social movements by describing actions, organizational forms, possibilities of agency, and underlying theories from the perspectives of the protagonists involved. Since my films do not take a «neutral» stance, they are often accused of being «partisan,» and this is something people often hold against me. However, I doubt that this «neutral» stance is even possible, since the very definition of «neutrality» derives from social power relations. If one approaches the ubiquitous Jean-Luc Godard from the «other side,» the other of Peter Wollen’s «Two Avant-gardes,» it seems that the experiment is what made it possible (for Godard and others) to make film politically in an ideal film world. What did this mean to experimental filmmakers? In how far is (and was) their work political? In The Two Avant-gardes, an essay that appeared in Studio International in November 1975, Peter Wollen describes the discussions between two avant-garde movements. The filmmakers  he mentions the auteurs in France and a few Germans  are on one side, while the co-ops — experimental filmmakers who come from art, most of them from New York and England  are on the other. For the purposes of this small contribution, the debate between these two side can be summed up as follows: the filmmakers accused the co-ops of being elitists; the co-ops refuted this with an attack on the traditional form, whose retention would make real change impossible.